GlaxoSmithKline announced the launch of Arnuity Ellipta (fluticasone furoate inhalation powder) and Incruse Ellipta (umeclidinium bromide inhalation powder). Arnuity Ellipta is an inhaled corticosteroid indicated for the maintenance treatment of asthma as prophylactic therapy in patients aged ≥12 years old. Corticosteroids act by reducing inflammation associated with asthma and helps to prevent and control asthma symptoms. They have a wide range of actions on multiple cell types (eg, mast cells, eosinophils, neutrophils macrophages, lymphocytes) and mediators (eg, histamine, eicosanoids, leukotrienes, cytokines). Incruse Ellipta is an anticholinergic indicated for the long-term maintenance treatment of airflow obstruction in patients with chronic obstructive pulmonary disease (COPD), including chronic bronchitis and/or emphysema. It is a long-acting bronchodilator that relaxes airway smooth muscles and improves airflow through the lungs. 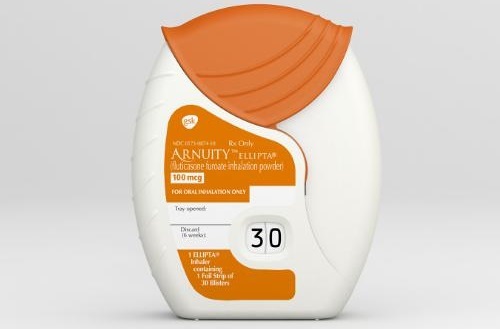 Arnuity Ellipta is available as 100mcg and 200mcg strengths with an inhaler and a foil strip containing 30 blisters. Incruse Ellipta is available as a 62.5mcg strength with an inhaler and a foil strip containing 30 blisters. Both are intended for use with the Ellipta inhaler. For more information call (888) 825-5249 or visit GSK.com.